April 25, 2013, 2:00 p.m.
(Week of 4/20/2013) The brothers suspected of setting the bombs at the Boston Marathon last week had lived in the United States for ten years; one was apparently a U.S. citizen. They were also Muslim. And the latest Economist/YouGov Poll suggests that many Americans question the loyalty of Muslim-Americans. 44% think of them as less patriotic than other Americans. There is particular concern among older Americans and among Republicans. 60 percent of respondents aged 65 and older, and 70 percent of all Republican respondents, regard Muslim-Americans as less patriotic than others. 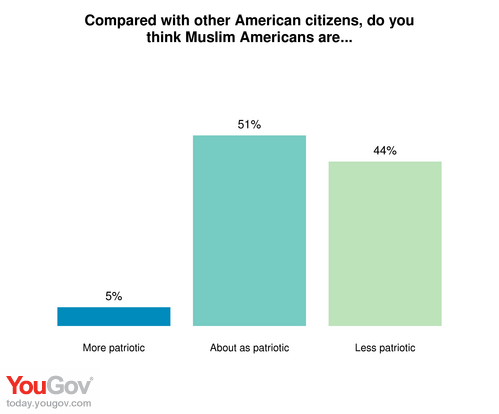 On the other hand, over half the public believes that Muslims are as patriotic as other citizens. While some question their loyalty, there is a consensus that Muslim-Americans are more likely than other religious groups to suffer discrimination. Nearly three in four believe they suffer at least a “fair amount” of discrimination. And more than a third say they suffer a “great deal” of discrimination. Only about four in ten think Christians and non-believers face some discrimination. 48% say Jews do. There are some major differences among groups, though. Two in three conservatives sampled believe Christian-Americans face a fair amount of discrimination, slightly more than the 57% of conservatives who see discrimination against Muslim-Americans. Only 19% of conservatives believe those who do not believe in God are discriminated against at least a “fair amount”. But 42% of those under 30 think non-believers face discrimination.